Taiwan's headline export growth slowed down to 9.4% year on year from 14.2%YoY, on the back off negative growth in electronic exports. In contrast, higher energy and metal prices pushed up import growth to 15.4%YoY from 12.0%YoY. 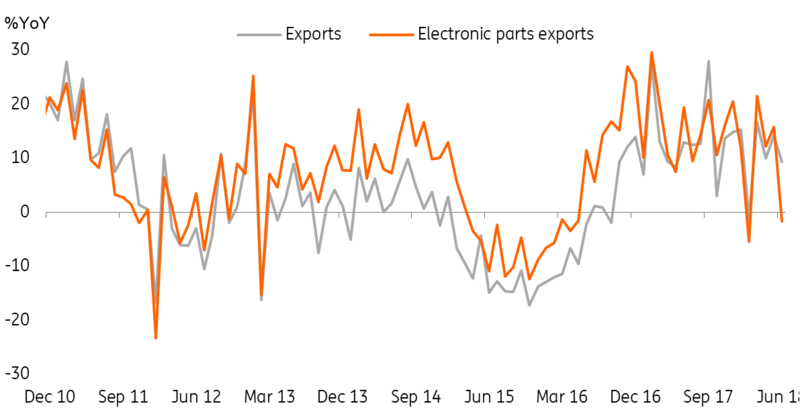 We see alarming signals from the negative annual growth of electronic parts exports (-1.7%YoY), and integrated circuits (-3.0%YoY). Electronic parts exports, which are important to Taiwan made up 30.9% of total exports in June. Combining the data of export destination, we believe that the export growth of electronic parts to the US and China have slowed which could be a harbinger of the upcoming slowdown to the sales of new smart devices. We have to realise that trade data in 1H18 has yet to reflect the full impact of the trade war between Mainland China and the US. We've only seen metal prices going up, which could be a result of the US tariffs on aluminium and steel and therefore, this data would only affect second quarter's GDP slightly. Trade war impact on Taiwan - for better or worse? How the trade tariff war impacts China, and the US affect Taiwan is an interesting topic. Taiwan is an exporter of electronic parts and machinery and also has an agriculture sector. Taiwan's electronic goods could benefit from the trade war as a substitution for Chinese electronic products subject to a 25% tariff from the US. Taiwan could also export its agriculture produce to China as a substitution for US agricultural products that face a 25% duty from China. But we'd like to highlight that not every company faces a positive prospect. Given that supply chain in the electronics sector is closely linked, tariffs on Chinese electronic products could also negatively affect Taiwan if it is a supplier to a Chinese firm that loses its export orders because of the 25% tariff. As expected, the impact on the labour market lags export activities, but we believe that the low unemployment rate (3.63%), could edge up gradually as the trade war escalates. Only time will tell if Taiwan benefits from the trade war as a substitute exporter or get hurts as its supply chain is hammered, but if things continue to escalate - one thing is sure - as the global economy is affected, global demand would fall and so would Taiwan's economic growth.